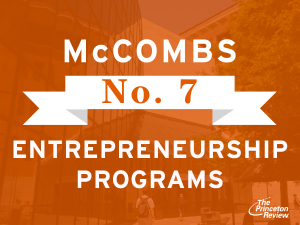 McCombs came in 7th in the nation in The Princeton Review’s tally of the top 25 graduate schools for entrepreneurship programs, which it publishes in partnership with Entrepreneur magazine. The top three spots, in order, went to Michigan, Babson, and Harvard. This is the fourth year in a row for McCombs to make the top 10 in the ranking, which has been published annually since 2006. Among public schools, McCombs is third, behind Michigan (1) and Virginia (5). The Princeton Review surveys nearly 2,000 programs across the country and examines entrepreneurship with a wide lens, touching upon faculty, students, and alumni, and including activities both inside and outside the classroom. At McCombs, the survey included entrepreneurship among the MSTC and MBA programs and the host of initiatives and opportunities available to students (see below). The survey measures programmatic items like scholarships, mentorship programs, and business competitions, but also considers outcomes, such as the number of businesses launched and their survivorship after graduation. Robert Franek, The Princeton Review’s senior vice president of publishing and a nationally recognized expert on college admissions, noted in a press release the high quality of the recognized schools’ faculties, courses, and out-of-class offerings. “Their students have extraordinary opportunities to network with established entrepreneurs, interact on teams…and develop skills to launch their own businesses,” Franek said. Venture Fellows, which helps MBAs get a leg up in the venture capital arena by offering internships with venture capital and private equity luminaries. Jon Brumley Texas Venture Labs, a campus-wide initiative that helps link students to the entrepreneurial, business, technology, and legal resources available on campus and provides mentoring, team-building, business plan validation, and technology commercialization. The Venture Labs Investment Competitions, which is held in Austin each May. Founded in 1984 as Moot Corp, it is the first and longest operating, inter-business-school, new-venture competition in the world. Austin Technology Incubator, which was the first university-based incubator in the country. Established in 1989, it has raised over $1 billion in investor capital and spawned more than 200 companies, including many new ventures created by Texas MBA students. Master of Science in Technology Commercialization (MSTC). Established in 1996, this one-year alternating weekend program is designed for aspiring entrepreneurs who want to identify new technologies with market potential, bring them to market, and create wealth in the process.